Are you caring for infants and toddlers and would like inspiration regarding creative art experiences for them? Are you looking for innovative engaging experiences to offer? If so this workshop is for you. 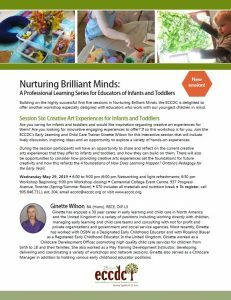 Join the ECCDC’s Early Learning and Child Care Trainer Ginette Wilson for this interactive session that will include lively discussion, inspiring ideas and an opportunity to explore a variety of hands-on experiences. During the session participants will have an opportunity to share and reflect on the current creative arts experiences that they offer to infants and toddlers, and how they can build on them. There will also be opportunities to consider how providing creative arts experiences set the foundations for future creativity and how this reflects the 4 foundations of How Does Learning Happen? Ontario’s Pedagogy for the Early Years. Fee includes materials and nutrition break. I give my consent to receive electronic messages from the ECCDC. Please help us determine our audience. Please list any food allergies attendees may have. Enter NA if this is not applicable. If any accommodations are required in order for you to participate,, please provide details below. 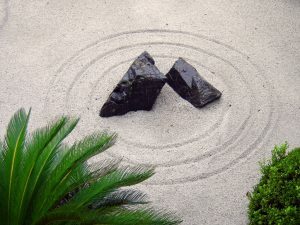 A member of our team will contact the you within 48 hours. Please note payments are non-refundable but registration is transferable to another individual. In the event of cancellation due to low registration or other unexpected circumstances, refunds will be issued within 30 days. For questions please contact our Training & Events team at 905-646-7311 ext.304. © Copyright 2014 ECCDC. All Rights Reserved. Niagara Website Design by Future Access Inc.